This was my first visit to the annual event, which celebrates kai moana (seafood) and the people who catch it, gather it and process it for the rest of us to enjoy. 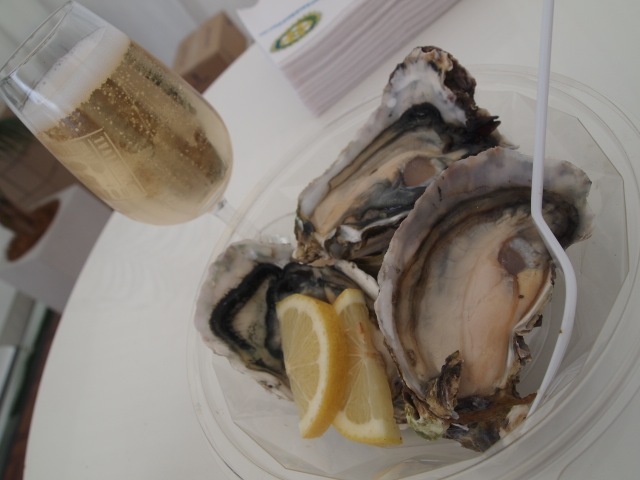 The Seafood Festival was held over the three day Auckland Anniversary Weekend (28 – 30 Jan). I was nursing a summer cold, and just barely made it to the last day of the festival. Did you know up to 130 species are commercially fished in our EEZ (Exclusive Economic Zone) areas? The $3B NZ seafood industry is evolving from fixed quota based wild capture (hoki, orange roughy, rock lobster, etc) to aquaculture species, which is heavily based on three species, – green-lipped mussels, pacific oysters and Chinook or King salmon. The aquaculture council has set itself the audacious target to grow the $380M industry to $1B by 2025, mainly through salmon and mussel expansion. Unfortunately the oyster industry is reeling from OsHV-1 virus decimating young stocks. The NZ seafood industry is one of the most sustainable in the world, but faces huge challenges to grow; it seems that every resource consent application is mired in controversy. The government, along with the major players (Sealord, Sanford, Aoteroa Fisheries, Wakatu Inc.) is spending $52M over the next 6 years to develop precision wild harvesting and to ‘domesticate’ the mussel (i.e., commercially breed mussel spat). Other research is mainly based on aquaculture and developing bioactives from marine byproducts. If you are interested in the state of the NZ seafood industry, the Ministry of Economic Development has a fascinating (maybe just me, but I was enthralled!) report on their website. Okay, enough industry info, I was here for the food! I was looking forward to the Wild Seafood challenge ($9), which promised kina (sea urchin), sea cucumber and whelks. When the tray was handed to me, I was puzzled to see mussels, oyster and sashimi. Not what anyone would call wild seafood. Mussel is so extensively farmed in NZ (100,000 tonnes last year alone), I doubt any wild mussels enter the supply chain. It turns out they ran out of the ‘wild’ stuff in the first two days of the festival. Talk about poor planning, even though most of the offerings in the rather tame seafood challenge were tasty. For what was supposed to be served, see Bunny Eats Design’s post. Raw fish salad with coconut and capsicum was bland and needed some seasoning. The oysters on half shell ($12 for 4) were dry and unappetising. When I asked a seafood scientist later, he confirmed my fears; the oysters were thawed. If you eat oysters regularly, you may already know this; – oysters are not harvested between November & March as they are spawning and would be too skinny for the market. But can someone explain why a Seafood Festival would serve thawed oysters raw? The seared scallops with wasabi and melon salsa, mayo and beef beignets ($7) were fresh, sweet and perfect to eat while sitting on the dock. The BBQ mussels with garlic and lemon butter ($7). Still the perfect combination. Then there was the posh section; Restaurant Alley, where some of the mainstays of the Auckland dining scene showcased their signature seafood dish. After wandering back and forth, I finally decided on seared tuna, char-grilled squid, nori puree, wakame and calamansi dressing ($12.50) from Dine. What a dish. The tuna pieces were topped with wasabi infused tobiko (flying fish roe), the tiny eggs popping in your mouth to release mini bursts of wasabi. The char-grilled squid tentacles were so tender and fantastically flavoured. It was the perfect dish of the festival. I didn’t taste the offering from Bellota, the other Peter Gordon restaurant. But the Mejillones en escabeche – green-lipped mussels, blood orange, black garlic, horseradish & green papaya salad dish looked intriguing. Overall, the festival is worth visiting if you are new to the seafood game. But if you know your seafood, and can cook well, I would skip this event. I wished there were fewer food stalls (there were not enough outstanding ones, most were very mediocre), and more retail stores selling products to bring home. There was a lack of variety, – if 130 species were fished in NZ waters, I would have loved to see and taste some of the less common ones, and maybe some of the experimental aquaculture species, – geoduck or butterfish. There was also a shortage of seating and cover. With the fantastic summer’s weather, it quickly became uncomfortably hot. Next time, I’ll know to come on the first day, skip the oysters and totally Dine out.